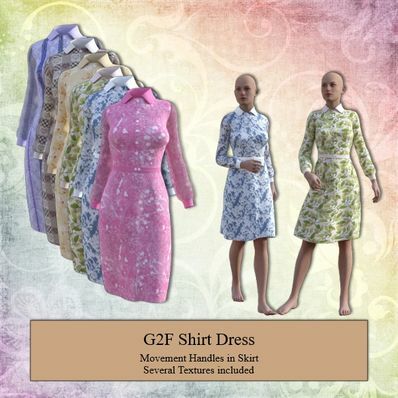 Shirt Dress for Genesis 2 Female for use in Daz Studio 4.8. Just found your site and wow! Thank you for all you do!!!! You have so many wonderful items here! Beautiful Dress! Thank you very much! Perfect. I still love to render G2F, and here is another wonderful Wilmap dress for her. Thank you very much! Thanks so much Wendy for these pretty shirt dresses. Best Wishes for the New Year. Thank you so much for your generosity and such wonderful clothes . Many of us can't keep updating . I am still using G2F so thank you so much for still supporting G2F. Useful and beautiful! Thanks for supporting G2F! Thank you SO MUCH for continuing to support G2F!!! Nice, thanks for continuing to make G2 stuff.